Ajanta Caves date from the 1st and 2nd century B.C. and are a series of caves, richly decorated with Buddhist art and tantric symbolism. Among the numerous attractions in Maharashtra, the untarnished caves of Ajanta have a splendor and charm of their own and have always attracted tourists from around the globe. Hidden away in the forests of Deccan, about 105km from Aurangabad city, the Ajanta caves are a pure blend of Buddhist culture and art. They are believed to have been built over a period spanning from 200BC to 650AD in two phases. 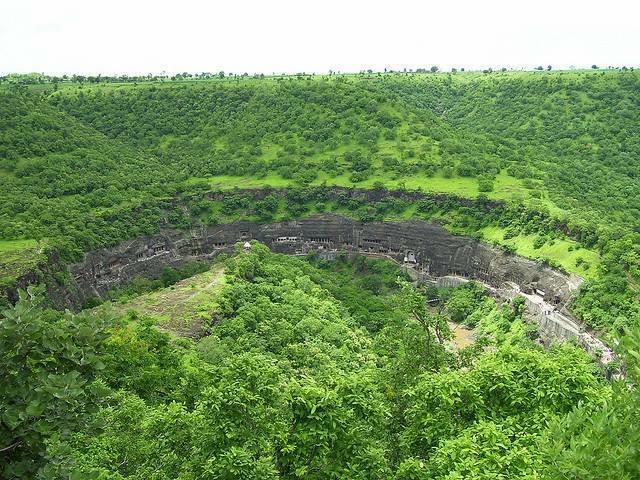 The area around Ajanta caves is heavily forested and after the use of these caves stopped, they were lost until 1819, when a British officer accidentally found them while on a hunting trip. The caves, presumed to be a sort of retreat for the Buddhist monks during the monsoon, are cut into the side of a cliff forming a horseshoe shape around the Wangorah River. The paintings and sculptures of Ajanta, considered as masterpieces of Buddhist religious artwork, have had considerable artistic influence. A world heritage site, the complex consists of approximately 30 caves, 5 temples and 25 monasteries. Majority of caves are rectangular Vihara halls (monasteries) and the rest, Chaitya-grihas (halls of worship) with Buddhist shrines for meditation. The ceilings and walls echo the Jataka tales of Buddha through its outright brilliant paintings and sculptures. Most part of the Ajanta caves are deluged in darkness or else very dimly lit in order to preserve the paintings, adding to its mysterious beauty. Take one whole day to indulge in its beauty and I guarantee you a powerful journey through the past. Through the sombre caves which were once home to hundreds of Buddhist monks, through the rhythmic chants that once vibrated its walls and through the matchless era of Indian art.